There are two ways to access the information about the titles you manage. 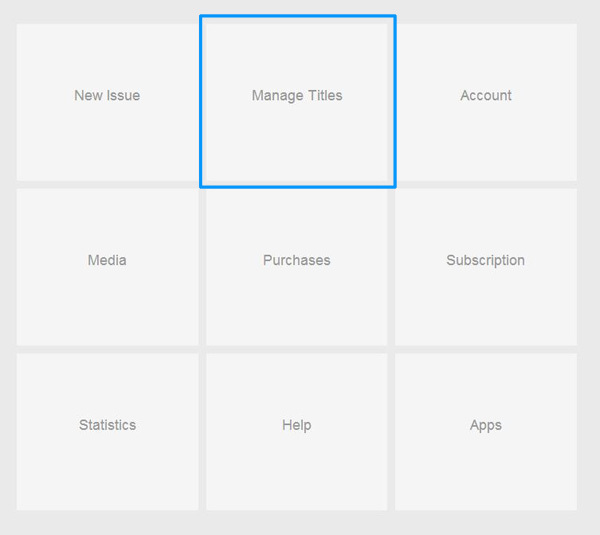 After login, click on the “Manage Titles” box and access all information related to the account. 2.From the left-side menu, while in the account, from any page. Basic information about the title. Title Name, Number of issues in the title, Last Upload date, Last issue added date. You can rename your title by clicking the “edit” text located to the right of the current name. If your title has any payment systems associated with it, they will be listed here. Single Issue, Paid Subscription time periods, and Free subscription (for iOS Newsstand apps). Please note: By clicking ‘Edit’ in this area you will be able to add new payment types and prices. To make those payment types active in the app, to edit after you save, or to delete contact support@mediawiremobile.com. Click to hide or show the info in these areas. Click to enable/disable the printing of the PDF button on the WebViewer for your readers. Click to enable/disable the download PDF button on the WebViewer for your readers. Click to enable/disable the archives button on the WebViewer for your readers. Click to enable/disable the publisher Info button on the WebViewer for your readers. The title description entered at title creation will show here. Click ‘Edit’ to make changes to the title description. This displays all the issues which reside under any given title. They will be displayed from the most recent publication date set to the oldest. Click on an issue to view/edit issue settings.